This is the 5th consecutive year, Brigade Group has been recognized by Great Place to Work® Institute (GPTWI) and The Economic Times and in fact, over the years, Brigade Group has significantly improved it’s ranking to reach this position. We at Brigade Group are delighted and humbled by this recognition and would like to continue to strive hard and make the organisation a great place to work in successive years. Azure at Brigade Exotica is set in the midst of 10 acres of greenery. The project is a pre-certified, GOLD-rated Green Building by the IGBC Green Homes. Boasting of one of the finest architecture in India today, Brigade Exotica offers spacious 3 and 4 bedroom residences that are designed to blend indoors and outdoors. The Brigade Team at the GPTW 2015 Award ceremony. 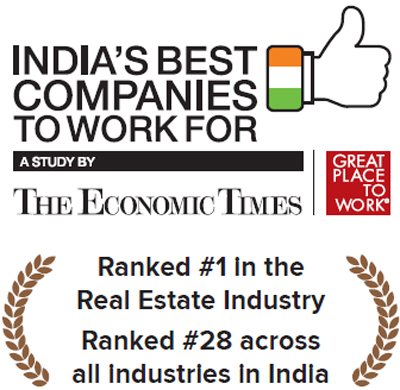 India’s Best Companies to Work for is an yearly study conducted by Great Place To Work Institute and The Economic Times. This year, over 700 organisations applied to be assessed for the study. As part of this assessment, organisations were studied through two different lenses. First, perceptions of the organisations’ employees. This was measured by surveying employees using a comprehensive questionnaire based on the Great Place To Work Institute’s research. Over 180,000 employees were surveyed in all making this the largest and most comprehensive survey of workplace culture in corporate India. Second, strength of people-related management practices of the organisations was assessed using a people practice assessment framework developed by Great Place To Work Institute based on its research on great workplaces. It is a fantastic feeling to be adjudged as ‘The Best Place to Work’ among all the Real Estate Companies in the country.